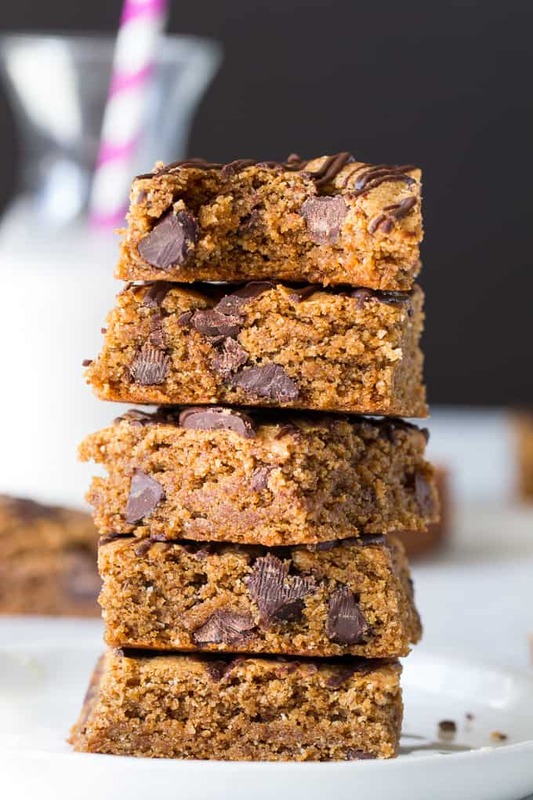 These are the ultimate chewy Paleo chocolate chip blondies, loads with almond butter and and drizzled with more melted chocolate, you won’t believe they’re grain free, dairy free, and actually good for you! Kid friendly and easy to make. Saturdays we have dessert! Are you guys with me on this? Aside from the month of January, when I posted all Whole30 recipes, all the time, Saturdays have been all about dessert – on the blog – for months now. 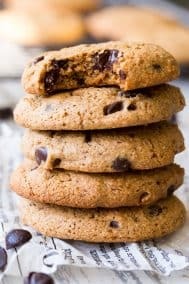 I like it this way – even though I’m sorta on team dessert-every-day, Saturday always feels like a good day to really indulge in full on, gooey, chewy, real-deal cookies, brownies, cakes, fudge, etc. Plus, typically we all have a few more minutes on a Saturday to bake than, say, a Tuesday. I strongly dislike Tuesdays, by the way. It always seems to rain on Tuesday and I always have way too much to do. Anyway, to go with the Saturday dessert theme, I’m bringing you extra-chocolatey-chunky-chewy blondies. I made these twice and the second time was most certainly the charm. For some reason I thought that adding an extra egg yolk was a good idea the first time around, but it was not. I realized that I only like that extra egg yolk in there when I’m using all coconut oil, not when almond butter is involved. 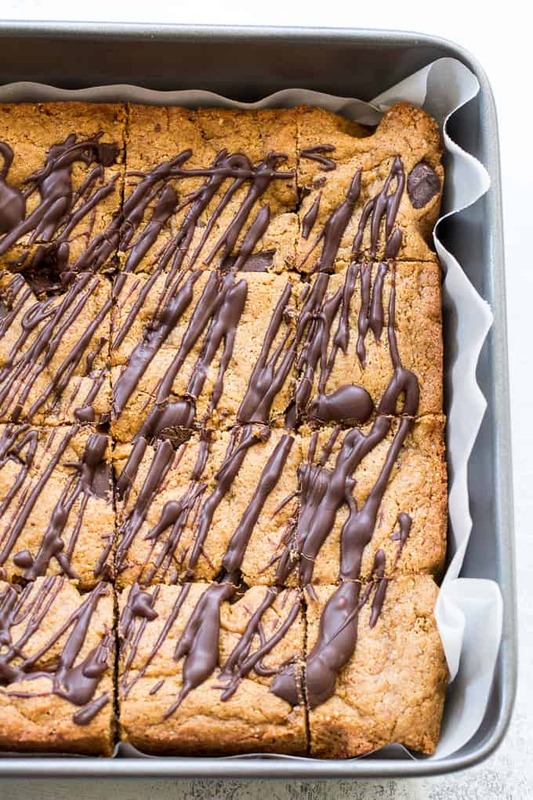 With almond butter, it just makes the bars too cakey. If there’s something besides Tuesdays that I strongly dislike, it’s cakey blondies. Or cookies. Not my thing at all! So, for try #2 (the next day) I got rid of the yolk, added more almond butter, more coconut sugar (just had to) a bit more coconut oil and a TBSP of coconut flour. So I sort of changed the entire thing, but, WHOA! It worked out perfectly. 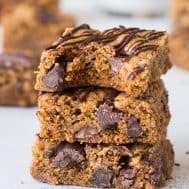 I got my chewy, dense, rich, chocolatey blondies, and, luckily didn’t have to make a third batch. Let me tell you – I start going completely out of my mind once I’m on the third batch of something. I question the meaning of my existence and just plain freak out like something horrible has actually happened. Fun times! 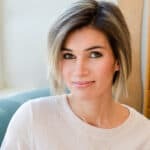 Somebody needs to start a food blogger emergency support hotline, I’m not kidding – see my rant on recipe heartbreak. I would totally call the hotline at least once per month. 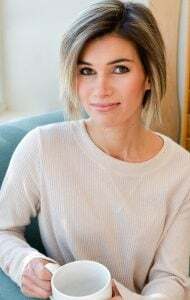 But enough about my recipe fail woes, ultimately I know that the struggle results in a thing or two learned about Paleo baking, so that you guys don’t have to cry on your kitchen floor in front of cakey or dry blondies. So many other things to cry about (seriously!) and DESSERT, if anything, is supposed to make us feel better. It’s totally okay to let your dessert make you feel better, by the way, that’s sort of the point. 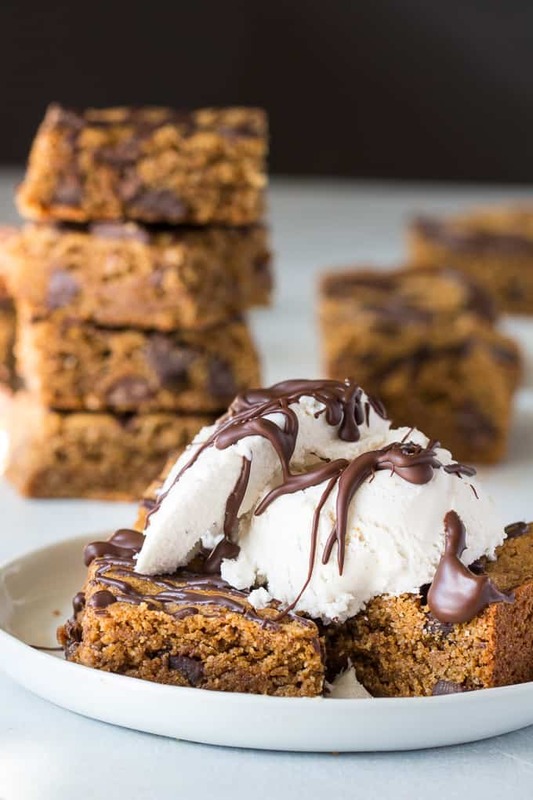 So here we go – easy, chewy, Paleo chocolate chip blondies are here – let’s bake! 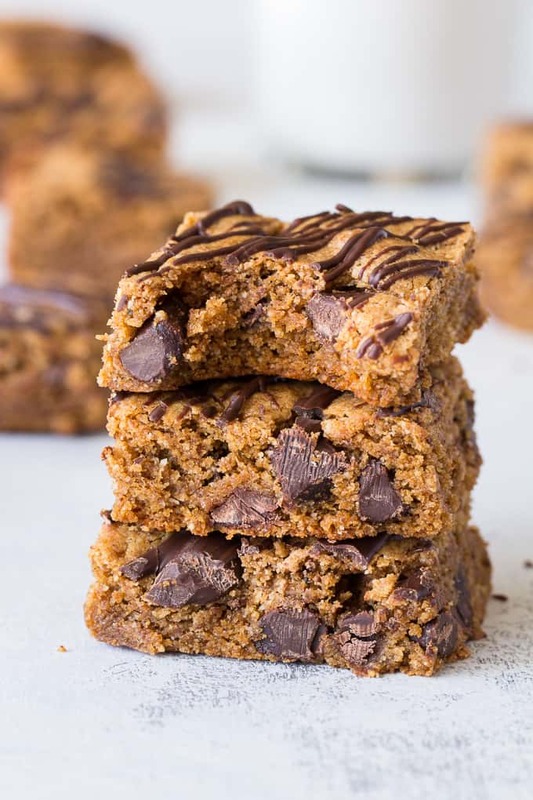 These are the ultimate chewy Paleo chocolate chip blondies, loads with almond butter and and drizzled with more melted chocolate, you won't believe they're grain free, dairy free, and actually good for you! Kid friendly and easy to make. Preheat your oven to 350 degrees and line an 8x8" baking pan with parchment paper. In a large bowl, using an electric hand mixer (recommended) or whisk, cream together the egg, almond butter, coconut sugar, vanilla and coconut oil until well combined. 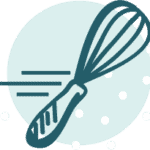 In a separate bowl, combine the almond flour, coconut flour, baking soda and salt. Slowly mix the dry ingredients into the wet on low speed or by hand until smooth and well combined. Stir in the chopped chocolate/chocolate chips and spread evenly in the prepared baking pan, scraping the bowl with a spatula to get every drop. Bake 15-20 in the preheated oven until lightly browned and center sets. Allow to cool, then melt your extra chocolate with the tsp coconut oil in a glass dish in the microwave for 20 seconds, then stirring to melt completely. 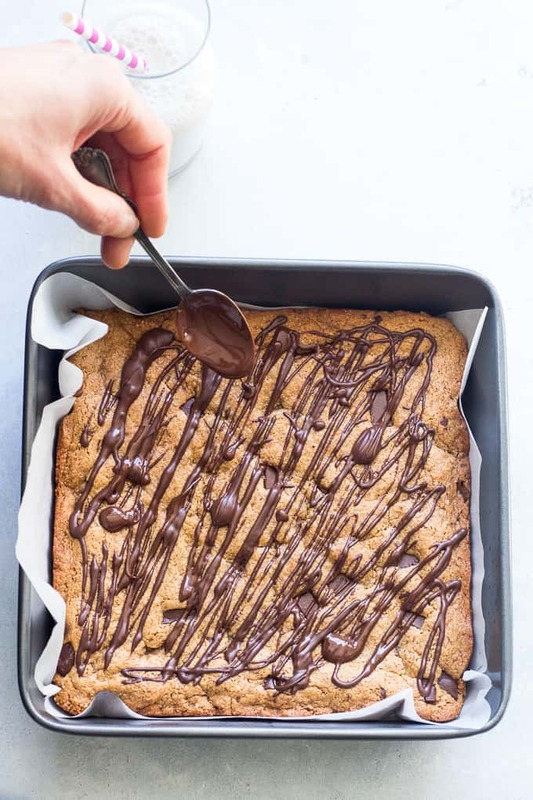 Drizzle with melted chocolate and allow the blondies to completely cool. Cut into 16 squares to serve. Enjoy! Want more crazy good Paleo bars and cookies? Try one of these! What do you do with recipe fails? What’s one thing you strongly dislike right now? Oh SNAP!! These are happening TODAY!!! ohhh these look so super good! I’m laughing out loud about the food blogger help line! I think it’s a great idea. These look so good!! I ma baking them tomorrow and using Lily’s stevia baking chocolate. I made these tonight and oh man! They’re delicious! 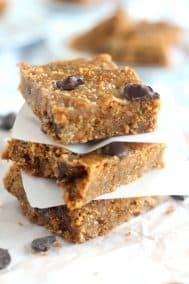 They taste like “real” blondies. Next time I’ll reduce the sugar a bit, but we’re just not used to sugar so they were a bit sweet. I also skipped the drizzle on top because I didn’t want to wait for them to cool, but next time I’ll be patient and add it. They’re still super good without it! I’m an every day dessert kind of gal too, and I appreciate you going through the recipe struggles so we don’t have to. These look amazing. After tasting the 1st batch I made a second batch. These are amazing and this is coming from a super picky eater. I made this tonight for after dinner dessert & brownies came delicious. I found the recipe on Instagram (love your recipes). As I was using the mixer noticed the dough had the consistency of crumbles so when I put it in the baking dish I just pressed it. Brownies came really good but I was just wondering … My kid approved them & he just devoured his piece ? These were so moist and delicious!!! Tasted even better than the “real” thing. Thank you! These are delicious! I was worried because my coconut oil separated before adding the flour mixture. I mixed & went ahead and pressed dough into the pan. They baked up perfectly and looked exactly like your pic. Everyone of your recipes work and are amazing. 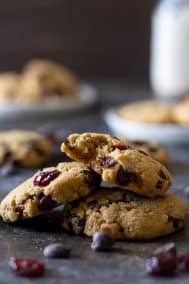 Living Paleo 3+ years – you’ve brought baked goods back into our lives. Thank you! Not to be annoying with questions about substitutions, but… do you think cashew butter would work in lieu of the almond butter? My family loves these bars! So easy to make I even substituted 1/3 cup maples syrup in place of the coconut sugar…..awesome! These were great just not quite sweet enough, maybe since I added unsweetened dark chocolate chunks. So I sprinkled very, very lightly stevia powder on top. No one knew 🙂 Next time I think I might add 1/4 c. agave for extra sweetener.